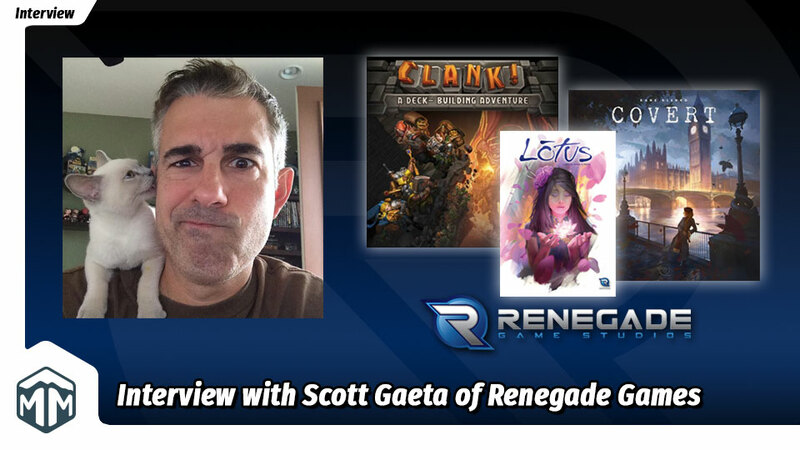 Join Meeple Mountain as we welcome Scott Gaeta, the owner and founder of Renegade Games, to the interview table. Renegade Games is the publisher and distributor of games such as Gravwell, Clank, Covert, Kitty Paw, Lotus, and the upcoming The Blood of an Englishman. Welcome Scott! Let’s start off light. What games have you been playing lately? Lots of prototypes and games we are considering publishing with partners from Europe and Asia. Besides that I’ve recently played Pocket Madness, Tiny Epic Galaxies, and Explorers of the North Sea. You have a lengthy tenure in the gaming industry. First as a store owner in 1994, then in various leadership positions at gaming companies before co-founding Cryptozoic, and now Renegade. Talk to us about the path you took to get where you are now. Like you mentioned I started off owning a game and comic store. This actually started as a sideline business. At the time I also owned a mail order poster company that was doing pretty well. The store really took off and when all the other store in the area were fighting over Magic I decided to be the Star Wars CCG store. That eventually led to me contracting for Decipher’s marketing and organized play department. Eventually I went to work for them, sold my two other businesses, and relocated to Virginia. Decipher was a special place and really had a great culture. I learned a lot there and took that with me to this day. That was the start of my long run of working on licensed games. Decipher led me to Upper Deck and then eventually co-founding Cryptozoic. During those years I worked on dozens of licensed games and I think at this point I’ve worked with every major movie, TV, and video game studio on most of the biggest brands in pop culture. I’ve been really lucky to have worked on some truly huge games and with great partners. Check out Scott’s extensive career in board gaming. Can you share any recommendations for people who are interested in taking a similar career path? Take whatever job you can get at a game company and do the best you can at it. Figure out what you’re good at. I started in organized play and marketing and that eventually led to running brand and product development for games like The Lord of the Rings, World of Warcraft, The Walking Dead, and dozens of others. I’m not a game designer but I’m a really good producer and understand all the parts of what makes a good game what customers want, sometimes even before they know they want it. I can see a finished game early on and help guide teams to a common vision. That’s me, figure out what you are good at and passionate about. Work super hard. Work ethic counts for a lot, you would be surprised. If you could pick a single accomplishment that you’re most proud of in your 22+ years in the industry, what would it be, and why? That’s really hard. I’ve experienced so many things I’m proud that I was a part of. The teamwork is very satisfying. If I absolutely had to pick one, I would say the last two years of Renegade. I’ve been really happy with the results so far. I think that we’ve accomplished a lot in a very crowded and competitive market. I’m proud of all our games, our designers, and the partners we work with. It’s been very satisfying. Renegade has an excellent reputation in the industry. Grant Rodiek, designer of Cry Havoc and owner of Hyperbole Games had a great quote about Renegade Games. What makes Renegade Games different from other game companies? @Gameosity @PlayRenegade They are the company I most aspire to be. Wow! I hadn’t heard that. It’s kind of embarrassing. Lol. To answer your question, I’m really not sure. We try to do things right. We try to treat people the way we want to be treated. I really like to work collaboratively with our designers and we’re trying to build a culture that fosters creativity and innovation on all levels. It is cliché to say but I have to say it anyways, but it’s the people. We are small but we all work super hard and love what we do. I think that comes through in our games and relationship with our customers. At least I hope it does! I asked Michael Mindes, founder of Tasty Minstrel Games, this question and I’m curious to hear your response. What are your thoughts about diversity in board gaming? I think it’s important on many levels. First of all industries like ours have a tendency to limit themselves. The “good ol’ boys club mentality” is dangerous and I’ve been going against it my entire career. In fact I owe a lot of my success to breaking those types of barriers down in different ways. First off, game customers are everywhere. Not just at the big conventions, on the usual websites, in game stores, etc. But a lot of our industries culture is not very welcoming to outsiders. 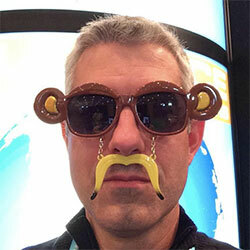 Sometimes there can be a steep social learning curve to being accepted. Traditionally our industries games can look very niche but that’s been getting a lot better the last five years. I could talk about this for hours but the bottom line is Renegade is trying to reach new gamers while also serving the core hobby. If you look at our stuff I think you will see that we are trying to break out of that niche. That’s not to say we won’t make a traditional sword and sorcery themed game but we want to be diverse. So the other side of this is the people who work in our industry and how we treat each other. Women in gaming has been getting a lot of attention and I think that’s great. Again, I’m not a fan of the good ol’ boys club mentality or “we’ve always done it that way”. Our industry has traditionally been male dominated both on the customer and creator side. But if you look at the bigger picture women make up half, or more, of the game market. So how do we reach those gamers and show them what our games have to offer. It’s certainly not by operating the way we always have. Overall though I would say things are moving in a positive direction. Our industry is growing and becoming more diverse. Read our interview with Michael Mindes from Tasty Minstrel Games. 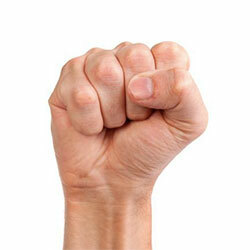 Digging into business practices a bit, what do you look for when you’re hiring employees? What sort of plans do you have for expanding your burgeoning gaming empire? Empire? The mental image that conjures doesn’t seem to fit. Rebellion might be more appropriate. Work ethic is definitely an important quality. We are small team so pulling your weight and then some is critical. Being a “yes man” is not allowed. We want contributors and thinkers, not robots. Eventually a decision has to get made, but the input people can contribute is valuable. Being able to move quickly and wear multiple hats helps too. Lastly, you have to be able to work with me. I like to hire super competent people and then let them do their thing. I hate to micro manage. Some people need that but I can’t work that way. I’m busy too and trust you to do your stuff. Moving forward we’ll continue to add resources as needed but cautiously and responsibly. Our biggest challenge is bandwidth for sure. How did Essen Spiel treat Renegade Games this year? It was exhausting but great. The biggest thing to come out of the fair for us is a huge slate of international partners. Fans in the EU and Asia will be seeing many more of our games in their native languages in 2017. Right now I’m consumed with finalizing a lot of those deals. Now that the con season is mostly over, what does the next 6 months look like for Renegade Games? Can you share any classified top secret projects with us? Well, we are still pretty busy with travel. Sara will be at several distributor events, we’ll both be at BBGCon, I have another overseas trip, an I’m sure there is something else I’m forgetting. New games Doggy Go!, Dicey Goblins, The Blood of an Englishman, and Lanterns: The Emperor’s Gifts all launch between now and the end of the year. Lanterns will also have its Tabletop episode run in November and the iOS and android version of the game launches in the next few weeks too. 2017 is really shaping up nicely. We have new games coming from Kane Klenko, J. Alex Kevern, Chris Chung, Aza Chen, and many others. Another game with Randy Hoyt over at Foxtrot plus some partnerships with international publishers will bring some games to the North American market that I think gamers will be happy with too. It’s going to be another exciting year and we’re already looking forward to it! Thanks so much for your time Scott. And thanks for being a model publisher in the board gaming industry! What do you think about Interview with Scott Gaeta, Founder of Renegade Games? Give us your opinions in the comments below!